I left Bahrain one week ago feeling Formula One had been cheated by the final result of the race. It never feels right when the driver who deserves to win doesn't and, in the paddock, I guess we all felt for Charles Leclerc, as he crawled to third place after completely dominating qualifying and the race. Yes, I know, this sort of things used to happen all the time up to 25/30 years ago, but like everybody else I got spoiled by the tremendous reliability of the modern Formula One cars, so a retirement or sudden loss of performance for mechanical reasons, tends to be a big surprise. 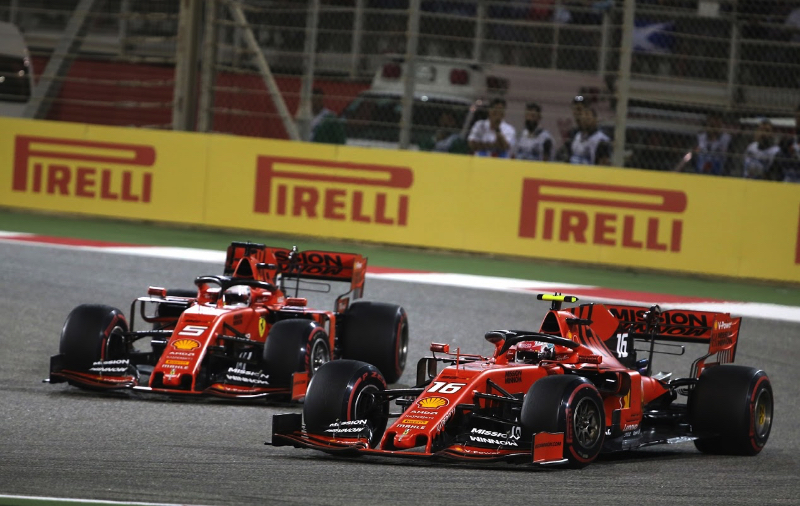 In the week after his tremendous performance in Bahrain, Charles Leclerc has been praised by everyone and their dogs and I would gladly jump on the bandwagon, because that was a heck of a performance and it didn't come out of the blue. If there's one driver that has been set for a great Formula One career from very early on, that driver is Charles Leclerc. After four major successes in karting, he won the GP3 and Formula 2 championships in successive years and then did extremely well for Sauber in his first Formula One season. As I wrote before the start of the season, if there was one driver under pressure at Ferrari this year, it was Sebastian Vettel, not Leclerc and that was very much in evidence in Bahrain. The four-times World Champion made quite a few mistakes in practice and qualifying before losing a straightforward battle with his younger team mate early in the race. Spinning after being passed by Hamilton just compounded Vettel's plight and even though he insisted, at the end of the race, his spin had nothing to do with pressure, it was difficult to buy that, because the German was, again, showing signs of not dealing very well when paired against a very quick driver. Obviously one race doesn't make the story of a season, there will be plenty of weekends this year in which Vettel will lead Ferrari's challenge, others where Leclerc will make the odd mistake and so on, but the message from last weekend was clear: there's a new top driver in Formula One, so Hamilton, Vettel, Verstappen and the rest of the field will have to reckon with the young Monegasque for a very, very long time. Refreshing as that was, to see a 21-year-old completely dominate a weekend without the need to clash with other drivers or make outrageous moves, passing Bottas and Vettel cleanly, after defending robustly but entirely within the limits of reason against Hamilton on the first lap, what gave me more reason to look forward to the rest of the season was the realisation Leclerc is just the tip of a nice iceberg, the leader of a brand new generation that can make their mark in Formula One for the next decade. Lando Norris, Alex Albon and George Russell have all done remarkably well in their first two Formula One races and given how well they performed in their junior careers, I'd say Leclerc will have company at the front of the field, as soon as these youngsters get their hands on winning cars. I've been pleasantly surprised by Norris' performance, in qualifying for the two races we've had so far, and in last week's race, because I wasn't too sure about the real value of his previous performances. Like Stroll and others before him, Norris had done a tremendous amount of testing in Formula 3 and then in machinery equivalent in performance to his Formula 2 car, had been in teams that revolved around him and, therefore, was never racing on a level playing field with drivers with a lot less backing. There are no such advantages in Formula One, testing is limited, teams operate - most of them anyway - to get the most out of both drivers, so driver talent comes into play and the young British driver has done rather well against the far more experienced and equally talented Carlos Sainz. But the other youngster that has caught my eye is Alex Albon, because I really like his attitude in and out of the car. Fully committed when driving, unafraid of going over the limit to know how far he can push, the Anglo-Thai driver comes across as an uncomplicated young man out of the car, ignoring all sorts of pressure and clearly enjoying what he's doing. He lucked into a couple of points in Bahrain thanks to Renault's late double retirement, but he did rather well in both qualifying sessions we've had so far, handled himself in traffic against more experienced drivers and generally acts like he's been in Formula One for ages, not just a couple of months. For George Russell it hasn't been easy to show his talent, but even before he reminded us all of his tremendous speed when he tested for Mercedes three days after the Bahrain Grand Prix, he had again done quite well during the race weekend. I'm not part of the group of people that believe Robert Kubica is a shadow of his former self, even though I think the Pole needs another couple of clean weekends - and a chassis that handles the same as Russell's - to really assess his current level, so the Formula 2 champion's battle with Kubica in Bahrain, until their final pit stop, was very entertaining and they even managed to keep their unloved Williams FW42 close behind the back of the group, proving not so easy to pass for Grosjean, Sainz and Stroll, as they all recovered from their early mishaps. Like Leclerc, Norris and Albon, Russell seems destined to greater things, so there's a good chance in five years - with Hamilton and Vettel gone from Formula One - these four drivers and Max Verstappen will be the leaders of the pack. Based on what we've seen in the first two races of this season, I think we can say we've seen the future and, frankly, I liked what I saw!